I'm sorry that I haven't updated anything in two weeks, but I've just been so busy with studies, work and other stuff. And then, most of my freetime I've been working on my new knitting project. 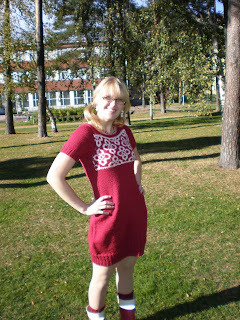 The minute I saw it on Jatta's blog last spring, I hoped she would write down the pattern for it, and finally, in August she did! So I've been knitting on it since then. Especially for the past week I've just been knitting, knitting and knitting as often as I had the chance, because it felt that since I was so close to finishing it, it was almost impossible to put it down and go to bed in the evening. But now, after hours of "hard work", it's finally finished! And I aboslutely LOVE it! It's wonderful! It's not too hot since it has short sleeves, yet it's not too cold either since it's made out of woolen 7 Veljestä yarn by Novita. Although, it ended up a few centimetres shorter than I had intended (I don't know if I miscalculated it or if my gauge was so different to Jatta's), so even though I wanted it to be a dress, I think I'll mosly use it as a tunic in stead. I don't like showing as much of my legs as I do now with it. 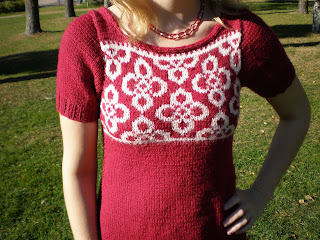 But there's nothing wrong with a new knitted tunic either! 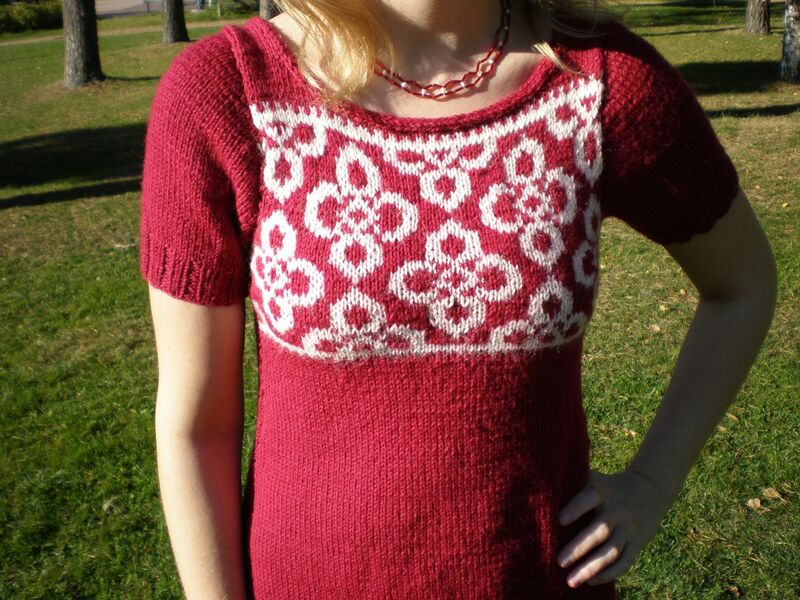 Maybe I'll knit another version of this later and then I can make it longer. Wow, den ser ljuvlig ut! Jag har inte stickat något stort på länge, är avundsjuk! Voi, miten nätti! Punainen väri sopii kyllä sinulle kivasti. :) Olen itsekin haaveillut Weeruskan neulovani ja tämä sinun versiosi vain lisäsi innostusta.